HOA Lot files: What you don’t know can really hurt you. Is your home is in an HOA? Do you consider your home an investment and want to protect it? If yes, then protect it by reviewing and correcting your LOT file. What is an HOA lot file? If your home is located in an HOA community, your communities’ management company maintains a LOT file on your house. It was created when you purchased your home and contains: approvals, violations, fines and even liens imposed by the HOA board. Think of your HOA LOT file as your home’s credit report. If your credit score dropped from 800 to 200, you would quickly call and correct any errors. Ignoring the problem will only make it more expensive to repair. The same holds true for your HOA lot file. Uncorrected errors in your file will cost you money and headaches and maybe your home. Many homeowners are unaware of errors until it is time to sell their home and then find out about past dues fines. These fines, left unpaid can become a lien against your home. authority to take your home? In Arizona, you have the right to review your LOT file. Your management company will make this an easy or difficult task. The challenge homeowner’s face with LOT files is the absence of a standard on how management companies are to provide this information and how often they allow homeowners access to their files. Some companies will email you the file at no cost. Others will charge .15 per page, while others require you to drive to their office to review your file. to access and download the pdf? Why don’t management companies send a copy, once a year at no cost to the homeowner? After all, the homeowner does pay their fees and should have the right to review the management companies’ records. Homeowners would then be made aware of errors and correct them before violations become fines that become liens. They won’t send me my lot file? If your management company delays or refuses to send you a copy of your LOT file: Be concerned. There is no reason why they should deny you. You may need to hire an attorney to gain access to your file. Remember, even though homeowners are the ones paying for their services, management companies have no motivation to make the process simple. If you find errors in your file, send a certified letter (I suggest a certified letter from previous experience) to the management company requesting them to correct their error and then request them to send you a copy of the corrected file. You may or may not receive the corrected copy. Homeowners should have simple, unlimited access to their LOT files AND the ability to correct errors in a timely period. Homeowners to receive, via email or US mail, a complete LOT file once a year at no cost. Management companies provide the LOT files on their secured web page for unlimited access by homeowners. Management companies must correct errors within thirty calendar days after being notified by the homeowner and then send the homeowner a corrected copy of the LOT file at no charge. All violations issued by the HOA or management company, must have a photo (with date stamp) proving the violation. Do you have a challenge or concern with your communities’ HOA? 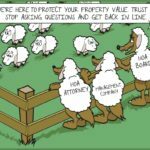 HOA Truth would like to hear from you. Click here to submit your story and suggestions on how to empower Homeowners.